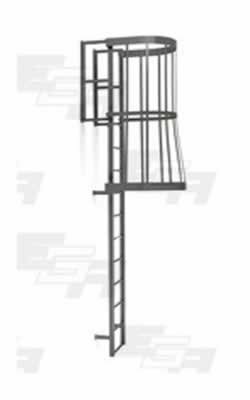 EGA Products 20 Step Fixed Cage Ladders are ideal for any company that needs vertical access to building roofs or elevated platforms where a ladder can be mounted vertically. The fixed cage ladder offers added safety with the steel cage enclosure. These cage ladders are made from 1 1/2" square tubing with 1" diameter rungs. Meets or exceeds OSHA specifications.